Piaf and Brel is a one-woman show performed by internationally acclaimed vocalist Melanie Gall. While being seated behind individual cabaret-like tables, prepare to be taken away by the power and clarity of Melanie Gall’s incredible vocals. 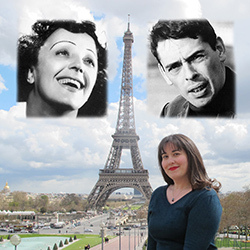 She tells the interesting story of the life of the French singer Edit Piaf and the Belgian singer and songwriter Jacques Brel. Both are iconic musical figures and exceptional singers. Gall mixes the story of the two musicians with facts from her own biography, bringing the audience closer to her and her performance. You are guaranteed to be taken away by the extreme professionalism and quality of Gall’s singing talent. Her singing abilities are without a doubt exceptional and her singing in French is very close to that of the original. Being a big fan of Edit Piaf and going to the show thinking that is very hard to duplicate her unique voice, I was pleasantly surprised and not disappointed by Gall’s performance. As a French speaking person myself and someone who has spent a considerable number of years in Paris, I was taken back to the streets of Paris with Gall’s singing and storytelling. For the audience member who is not familiar with the biography of two grand singers this play will no doubt be educational and moving. Melanie Gall is without a doubt very passionate about French chanson and she passes this on to the audience, making one hour fly by too fast.